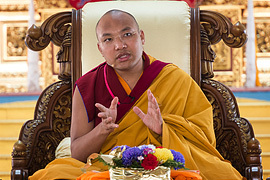 From his seat-in-exile at Rumtek Dharma Chakra Centre, His Holiness the Sixteenth Karmapa worked tirelessly to spread the dharma throughout the world, visiting countries not yet exposed to the Buddhist teachings and establishing centers to help keep this dharma activity alive. 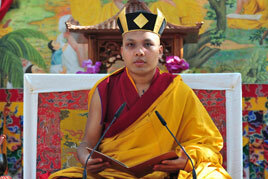 As he travelled, the Karmapa saw it would be necessary for highly trained tulkus and monks to carry on the teachings. 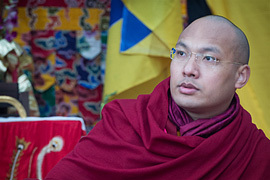 To fulfill this role and insure that Buddhadharma would flourish, future generations of Kagyu teachers must be schooled in the highest levels of dharma study and practice. 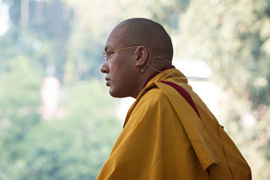 Part of His Holiness's original plan for Rumtek Monastery included the training of tulkus and monks in the ritual practices, arts, and philosophy of Tibetan Buddhism. 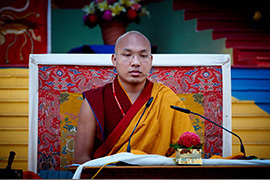 Before he established the Karma Shri Nalanda Institute (KSNI), the Karmapa founded the Karma Jamyang Khang Primary School in 1978 as a preparatory school where students would begin their rigorous education as a foundation for later teaching. 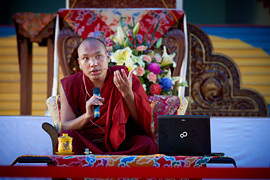 Since KSNI was founded, Karma Jamyang Khang serves solely to educate young members of the monks' community in Tibetan grammar and poetry, English, the ritual arts, and instruction in Buddhist texts and sadhanas. 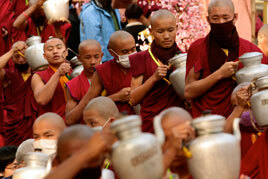 This program of study continues for many years, and culminates with intensive training in an area of ritual practice. 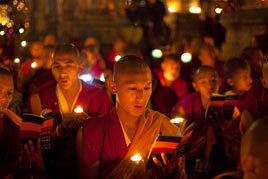 Life for those in the monks' community revolves around prayers and tantric practice rituals whose ultimate goal is the complete liberation of all sentient beings. 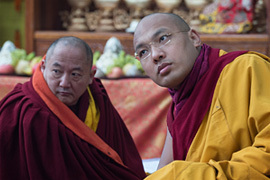 Young monks begin their monastic training with a nine-year program of study of the ritual texts of the Karma Kagyu lineage. 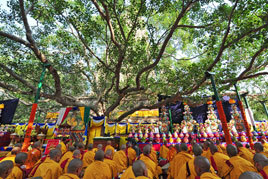 According to the Tsurphu tradition in which the monks are trained, there are thirty-six sets of texts that must be memorized, some quite long and difficult. 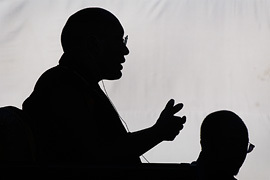 Each student is tested on his mastery of the texts by his teacher and by the monks' leader, or scripture teacher, who confers a seal for each text that has been successfully memorized. 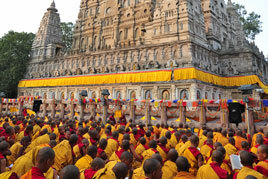 With this part of their monastic education complete, the monks embark on intensive training in all aspects of the tantric rites conducted at the monastery. 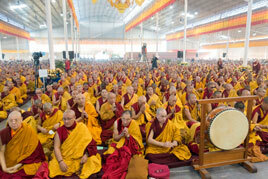 Several years are spent learning each ritual skill, including shrine keeping, chanting, torma making, the playing of musical instruments, construction of sand mandalas, and sacred dance. 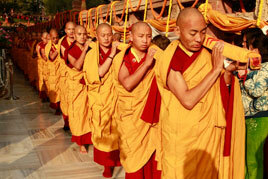 Eventually, each monk specializes in one of these areas. 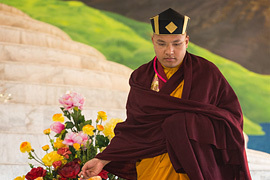 Some who will go on to fill roles such as umdze (chant master) or chopen (ritual master) undertake a further period of study that spans several more years necessary to master the intricacies of their future positions. 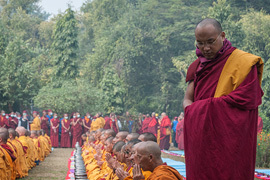 It's a tradition at the monastery that when each monk completes his training, he sponsors a celebration, offering tea or a special meal for everyone in the monks' community. Students start their day at 5:00 a.m., devoting the early morning to text memorization and taking short tests on the previous day's material. 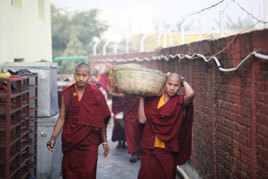 Their work continues until breakfast at 7:30. 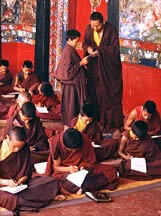 After breakfast, and again after lunch, younger students study Tibetan, English, writing, and spelling. 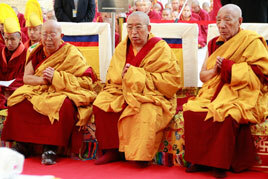 Older monks learn torma making and ritual instrument playing. 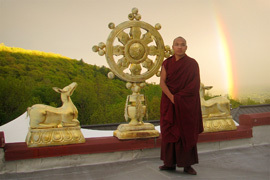 Late afternoon is devoted to memorizing texts, and after dinner, the students return to their rooms where older monks perform practices such as Mahakala, and younger monks study. 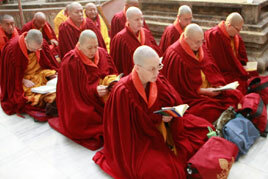 Each month, in addition to daily study and classes, the monastic routine includes week-long practices, focused on specific buddhas, deities, protectors, or lineage masters, whose dates are established according to the Tsurphu astrological system. 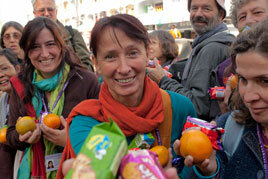 Some months, the practices span two weeks. 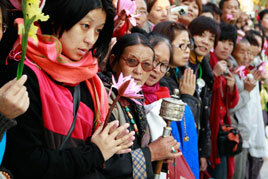 One-day practices and prayer ceremonies are held on special days of the month. 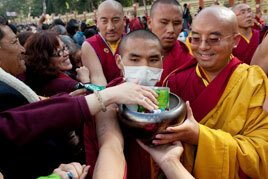 The monks also perform special pujas at the request of others.